Following up a Toronto performance the previous night, Florence and the Machine took to Osheaga's River Stage just in time to have their set bathed in the hazy glow of the setting sun. The effect added significantly to the aesthetic on display, as the group's statuesque frontwoman, appearing as a veritable indie priestess, took centre stage framed by a simple, symmetrical backdrop. 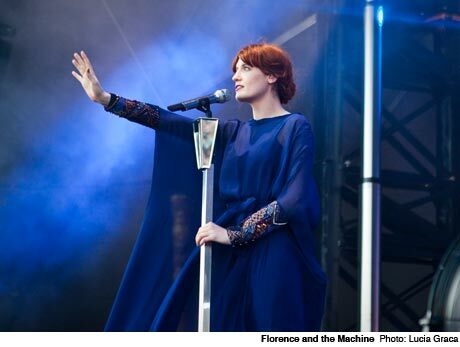 To see Florence Welch and co. perform is to see the term "cult following" take on new meaning -- their sophomore album, Ceremonials, is aptly named, and at many points, the show took on a ritualistic air. Welch's demure posture throughout opener "Only If for the Night" was quickly replaced by an ambling energy that sent the songstress bouncing from one end of the stage to another, and when stationary, the orb-like backlights encircling her head, almost halo-like, created the effect of a Klimt mural made flesh. Before launching into crowd favourite "Rabbit Heart," Welch reached out to the audience, shouting "We need human sacrifices." Apparently more than willing to acquiesce, fans held one another aloft on their shoulders as the band kicked off what was one of the evening's most spirited numbers. By the time the set moved into "Dog Days Are Over," the mass of fans, both old and newly converted, was firmly situated in Welch's gauzy, black pocket, hand-clapping its way towards the song's rousing chorus. Of course, in the end, Welch's herculean pipes were the stars of the show, but it was the intimacy she and her cohorts managed to conjure, even in this immense venue, that made this performance a highlight to be remembered.